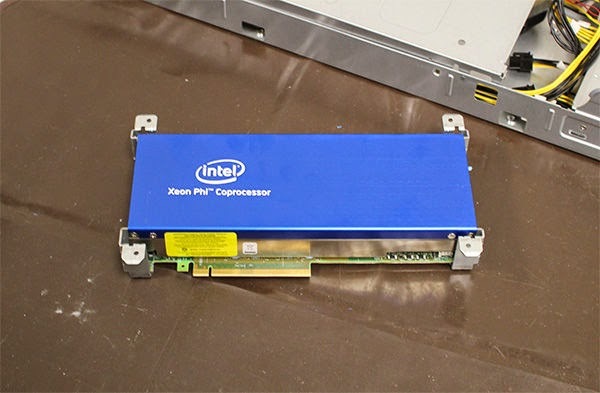 Intel Xeon Phi chip available now . With this family of more powerful and more energy efficient processors, the manufacturer will make a breakthrough in the market of HPC systems. The peculiarity of Xeon Phi: where NVIDIA and AMD use a proprietary architecture, Intel-based product on the x86 architecture. The benefit is significant, since the programs are optimized for a server running based Xeon processors turn perfectly on shipping machines Xeon Phi, without any rewriting of code is required. There are currently three ranges of Xeon Phi: coprocessors in 3100 are used for the undemanding parallel computing, the 5100 models are focused on intensive use of memory while the 7100 series is designed for calculations requiring many resources. The 7120P and 7120X now adds the 7120D. Having, like its comrades, 61 cores running at about 1.2 GHz (Turbo mode off). It is associated with 16 GB of RAM. This new model is distinguished by a TDP of 270 W, 10% lower than other coprocessors of Series 7100 Other notable difference. PCB of the card no longer has a connector compatible with PCI Express x24 ports. The first supercomputer to use Cori Knights Landing, which includes about 9,300 chips. By the National Centre for Energy Research Scientific Computing from Berkeley, California will take place in 2016. Topology of the system is based on the interconnection of Cray, as Titan, the world’s second fastest supercomputer deployed by the U.S. Department of Energy at Oak Ridge National Laboratory in Tennessee.